By the title of this post one would assume that I am actually a winning blackjack player and I can honestly tell you that I am not. What I am is a guy who can extend my play and occasionally pull a nice hunk of change off of the table. Blackjack is a game of ebbs and flows. The crucial element is to know when to get your winnings off the table when you can. The reality is, to be a truly profitable blackjack player you have to either be a card counter or not play at all. Since we are not trying to get thrown out of a casino, let’s assume that you are not going to count cards and you will in fact belly up to the table and plunk down your hard earned cash. Trust me, it’s even more fun when you know what you are doing! To start, I am going to assume that you know basic strategy. If you don’t, or need a quick refresher, you can go to this site that lays out everything you need to know to get you to the point for which we can start talking. In order to understand the nature of this game you have to think about it as a 50/50 proposition. If you play basic strategy you will have a great opportunity to win the individual outcome or hand. Now just like a coin toss, sometimes you are going to win and sometimes you are going to lose. But within a session there are streaks, and it’s those streaks that you have to exploit. This is key because you will need the break in the action. 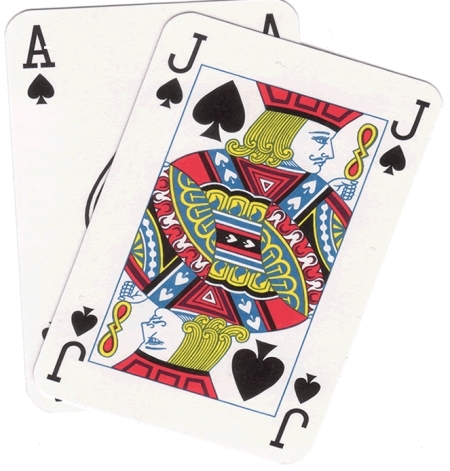 Blackjack is a very fast game and when it’s going bad you will be thanking the gambling Gods when the dealer has to yell back to the Pit Boss, “shuffle check!” It’s also important because basic strategy assumes a certain amount of decks (of cards) in the shoe. If you are playing on a table with an automatic shuffler, things are constantly changing. So consequently the times that the cards are favoring the players are often greatly diminished. Plus there are other theories on that, but I won’t get into them right now. Just look for a table with a shoe and you are in. So now you have a table and some people who look like they know what they are doing and you are ready to play. As I said before, this game is a streaky one and you have to ride the good streaks and get off when it’s going bad. And that brings me to the heart of the strategy: betting. 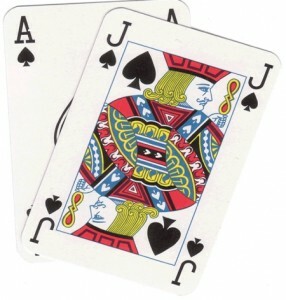 The key to Blackjack is the betting; more to the point hedging your bet. I can not stress this enough. You have to be able to take your winnings and constantly push up your bet for the next hand. Not everything, but a good amount because when you are on a roll you want to maximize your output. When you are losing you are only ever losing the table minimum. This is why you must find the table and limit that you are comfortable with. Let me illustrate. $400 – $30 = $370 at the start of the first hand. $30+$30+ 370 = $430 after winning that first hand. $430- $50 (second bet)= $380 at the start of the second hand. Things are now cooking and you win the next hand. Now you win $50 and that is paid out right next to your $50 bet. The next hand out, you increase your bet to $75. Now you have completely covered your initial exposure of $30 (your original bet) and a total profit of $5. But wait, you still have that $75 bet for the next hand. If you win that next hand you are really playing with the house money! That is pure profit and all sorts of great things happen at this point. You keep this pattern going until you get to $125; at that point you increase your bet at $50 per consecutive win. When you get to $250 then you can increase your bet by $75 or $100 (a “check”) until the cows come home! It’s important to understand that at any time you lose you take you bet down to the minimum of $30. There will be a large temptation to put a big bet up there after you have lost a hand where you had $150 bet, but don’t. You are throwing your profits away because just as quickly as you can win 5,8,10 hands in a row you can certainly lose that many. So the key is to only lose a small amount when you are losing and win as much as you can when you are winning. So many times I have been playing with people who always bet the minimum and never increase their bet. They will win 10 hands in a row and actually end up losing all of their money because they will just keep playing and playing and eventually lose it all back to the casino. The game is basically a coin flip, so when you are on the plus side, you really need to be taking advantage of the situation. This brings me back to the importance of that dealer shoe. You need that chance to actually win. You need the opportunity to have that break in the action and reassess. When you have made a good profit you should leave. There are so many blackjack tables in Vegas that there is no reason to be married to any one table. If you have been taking a beating, maybe it’s a good time to grab a snack or something. Move to a new location and start again. This game is like a wave; you always want to get out when you are going up and don’t stay too long or it will all come crashing down. This is obviously going to be a multi-installment post. More on this to come.